Jesus Dust: St. Benedict's Rule for Today? It was 480 C. E. and the old structures of the Roman empire were already crumbling. This was to be one of the great pivot points of history. Into this world in transition, where those seeking to be most fully devoted to God escaped empire by fleeing to the desert as hermits or gathered around a guru, was born Benedict of Nursia. Benedict’s Rule, a model of Christian discipleship that was community-centered, has endured as a living text for more than 1500 years, making it, according to some, the most influential text on Western society after the Bible. Even more impressively, Benedictines are widely credited with having saved Western civilization from the ravages of the barbarian invasions. While Benedictine history is unquestionably impressive, what is surprising is the contemporary revival of interest in the insights this storied tradition has to offer those seeking to craft lives of discipleship in today’s world. The decades since Vatican II have seen a marked increase in the number of Oblates and associates—those with formal ties to monastic communities who apply the Rule of Benedict to married or single life outside the monastery. Additionally, a loose movement of Christian intentional communities, dubbing itself “the new monasticism” has purposefully sought to draw upon the wisdom of the Benedictine tradition to enrich its own practice. Neomonastics have published a handful of titles and many others have added to those which draw upon Benedict’s Rule to offer the Christian mainstream Monk Habits for Everyday People and tips on How to Be Monastic and Not Leave Your Day Job. In continuity with these developments, this essay considers three relevant applications of Benedictine insight for those seeking to forge for themselves a way of life following Jesus in the contemporary Western context. Benedictinism distinguished itself in Benedict’s day by the centrality of community in its Rule. Benedict begins his Rule by identifying the four different types of monks, and asserting that Cenobites—those who “are based in a monastery and fulfil their service of the Lord under a rule and an abbot or abbess”—are “the strongest kind.” He contrasts Cenobite practice to the relational isolation of the hermitic Anchorites, the wandering pairs of Sarabites and the vagabond individual Gyrovagues, which he considers the worst of the bunch. In these comparisons, two of Benedict’s central values emerge: relational and geographical stability. How might the wisdom of Benedict’s stability be applied today? Neomonastics provide the most obvious example, making yearly renewals of commitment to their shared-residence fellowships, which are themselves deeply local. But is there any meaningful ways that Christians could glean Benedict’s wisdom without converting to neomonasticism? I believe so. Two approaches can be imagined, with innumerable expressions. First, one might resolve to remain in one place, one city or even one residence. While many will inevitably come and go, others will spend long years and this can approximate relational stability. Moving to be nearer to family—those most enduring of relationships—can be seen in this light. The geographically stable might also seek lifetime employment in a single company, lifetime membership in a single church, even lifetime patronage at a single grocer or coffeehouse, all of which would result in increased stability in relationships. A second contemporary approach to stability could take shape if a collection of friends decided that they wanted to spend their lives together. The expression of this relational stability could be as thin as a commitment to gather yearly for a weekend getaway, or as thick as a vow to always live in the same neighborhood, and make any moves en masse. It should be noted that steps toward either relational or geographical stability would increasingly leave one out of step with the mainstream as job offers that others deem too-good-to-refuse are passed up and the tug of white flight is resisted. who will test our virtues, our values, and our depth. Applying the centrality of disciplined regimens and psychologically astute practices of prayer and scripture to contemporary life need not be complicated, though it will not be easy. Time must be set aside. Many, even Protestants, are experimenting with praying the divine hours, as fresh titles attest. Evangelicals have long promoted “daily quiet times” of morning reading and prayer. While this practice, as I have learned firsthand, is often used inappropriately as a gauge of spiritual health and maturity, it no less has much to commend it. 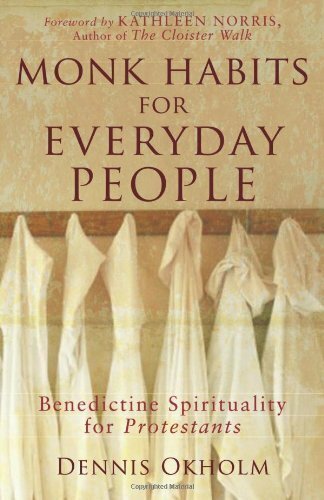 Whether they elect to pray the hours or keep a quiet time, or follow another disciplined pattern of prayer and scripture, contemporary disciples who wish to integrate the wisdom of Benedictine spirituality into their lives will have to set aside dedicated time for these central practices. There is simply no way to be in any meaningful sense “monastic” without prioritizing these basic Christian practices. The Benedictine wisdom we have surveyed is both timeless and timely. Relationships have always been and will always be a primary means of grace, and the Benedictine practice of stability capitalizes on this fact—something of particular relevance to our hyper-mobile society. Most people must spend the lion’s share of their lives engaged in the mundane tasks of daily life—working, eating, conversing—and Benedict challenges us to discover God’s presence even here, even in the 21st century. Scripture and prayer are among the most fundamental practices of Christian tradition and Benedict has invited believers for 1500 years to set aside time for these—and his invitation extends to today’s world in which these increasingly seem overly pious and passé. May Benedictine wisdom find expression today in Christians and churches who exercise these practices and therein find the God Benedict knew to be everywhere. Brook, J. (1991). The School of Prayer: An Introduction to the Divine Office for All Christians. Liturgical Press. Chittister, J. (1991). 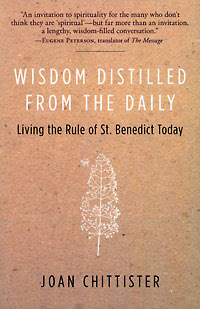 Wisdom Distilled from the Daily: Living the Rule of St. Benedict Today. HarperOne. Marett-Crosby, A. (2003). The Benedictine Handbook. Liturgical Press. Okholm, D. (2007). 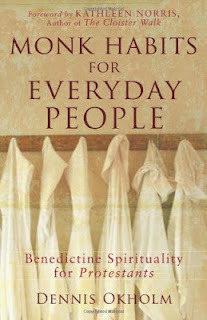 Monk Habits for Everyday People: Benedictine Spirituality for Protestants. Brazos Press. Tickle, P. (2007). This Is What I Pray Today: Divine Hours Prayers For Children. Dutton Juvenile. Tvedten, B. B. (2006). 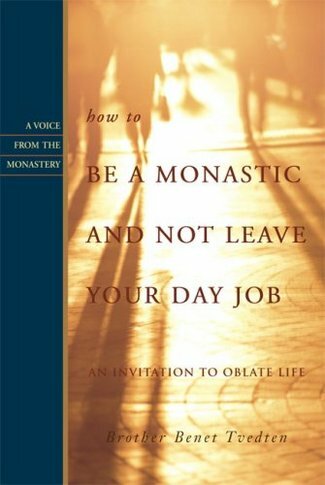 How to Be a Monastic and Not Leave Your Day Job: An Invitation to Oblate Life. Paraclete Press. The Benedictine Handbook, 227. Robert Atwell. ibid, 269. Colman O Claibaigh OSB. The Benedictine Handbook, 14, 15. The Rule of Benedict. The Benedictine Handbook, 298. Dwight Longenecker. The Benedictine Handbook, 43. The Rule of Benedict. The Benedictine Handbook, 104. Demetrius R. Dumm OSB. The Benedictine Handbook, 107. Michael Casey OCSO. The Benedictine Handbook, 106. Michael Casey OCSO. See, for example: The School of Prayer: An Introduction to the Divine Office for All Christians by John Brook and This is What I Pray Today: Divine Hours Prayers for Children by Phyllis Tickle. This is really great! Could you tell me the author of this article as I would like to reference it in my uni essay. Thanks for the insight, it is really helpful! Well,Lahna. The author would be me: Christopher B. James.